I thought of this yesterday as we celebrated our Joseph’s … 13th birthday! 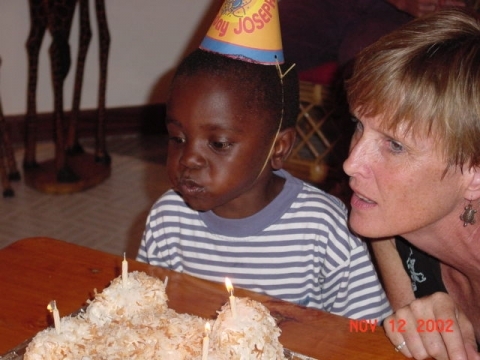 Ten years ago, when Joseph became our fourth child, he was estimated to be 2.5 years old. So since no one knew when his actual birth date was… we chose a birth date that would align with that timing and gave him the reverse of Russ’s birthday and month 11/9/99 (just in case, in our old age, our memory’s failed us :)). So approximately 6 months after Joseph became our son, we celebrated his birthday for the very first time. We called it his 3rd FIRST birthday… and it was sweet beyond words!!! He loved the packages that came so beautifully wrapped…but was perfectly pleased to just be getting a beautifully wrapped package…he had no idea that he was supposed to actually OPEN it! Now…10 years later our lives have been blessed by having Joseph in our family…and even though he knows now, that he’s supposed to open a gift when someone gives one to him…he is still abundantly grateful for it as he is with most things in life and especially in family… even 10 years later at 13…he does not take life or family for granted! When we were in the USA this past September, one selfless little girl who had been so inspired by Walloon Lake Community Church’s VBS program where the kids raised enough money to build a whole house for a Granny and her Orphans in Uganda, that she decided to ‘dedicate’ her own birthday to the orphans. She sent out invitations to all her friends but asked that instead of a gift, if they could bring a donation for the orphans of The Way Home project! All her friends came to celebrate with donations for orphans in Uganda…so while she celebrated in Mancelona Michigan…she made impact on orphans, who never celebrate their birthdays, in Uganda…what a GIFT!!! 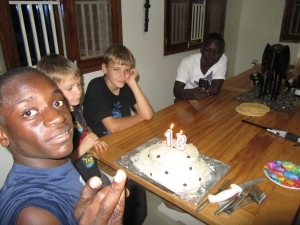 You can be part of “looking after orphans & widows” too with a birthday or any other creative way the spirit may move you to be part of impacting those less fortunate on the opposite side of the globe! ETERNAL INVESTMENTS… The Ultimate Christmas Gift ! Walk through a Granny interview with US!